Thin, seasonal Italian fruitcake. What is it called? Where can I buy it? 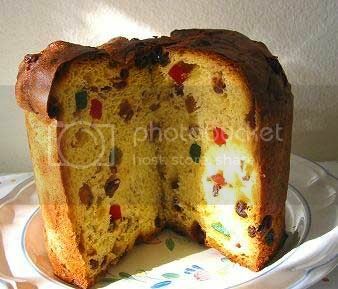 In late 2008 I purchased an "Italian fruitcake" from NapaStyle. No longer in their catalog. The sucker was about an inch thick and 9 to 10 inches diameter. Dense, chewy interior. Dusted with what I assume was powdered sugar. Wrapped in heavy paper lined with foil. I thought I recalled from the catalog text that this was something of a seasonal delicacy where it came from. Could be they were just making that up. What is it? Where (online) can I buy it? Panforte is what it's called (not to be confused with panettone. i think you might be referring to Panetone. oh wow! i've never seen/heard of Panforte before. Google has quite a few results for buying it online. Anyway, you can buy it through Amazon from various sellers. It is definitely panforte though it can also be referred to as Siena panforte, or Siena honey cake. This sounds fantastic, and not too hard to make, either. Ditto this, and more on Chowhound. Panforte it is! And some great stuff it was!! I know you have your answer, but your question brought Stollen to mind. So there's another delicious Christmas fruitcake to try when you have the opportunity!